An artist's interpretation of NASA's Dawn spacecraft in flight. This story was updatedat 4:45 p.m. EST. NASA?s once-canceledDawn mission to visit a pair of asteroids has been reinstated following amission review, space agency officials said Monday. NASAinitially canceled the Dawnmission, which calls for an ion-powered spacecraft to visit two largeasteroids, earlier this month only to reverse that decision, which drew ire andoppositionfrom planetary scientists at this month?s 37th Lunar and Planetary ScienceConference (LPSC). After anin-depth study of the cost overruns and technical challenges plaguing Dawn?sdevelopment, NASA officials concluded that the mission should proceed towards asummer 2007 launch target. ?When you?redoing deep planetary missions?.there are always pretty tall challenges,? NASAassociate administrator Rex Geveden told reporters in a Monday teleconference. ?Andit looks like Dawn is ready to take those on and beat them.? Thedecision buoyed Dawn mission scientists, who had mourned the project?scancellation earlier this month. ?Thismission goes up and down, but I?m happy,? Dawn team member Lucy McFadden, of theDepartment of Astronomy at the University of Maryland in College Park,Maryland, told SPACE.com. ?I want toget to work and get this thing off the ground.? NASA firstapproved the Dawn mission in 2001 as part of its low-cost Discoverymission program. Thespacecraft?s novel ion propulsion system draws on technology demonstrated byNASA?s DeepSpace 1 probe, though Dawn would mark the agency?s first science mission toemploy such an engine. 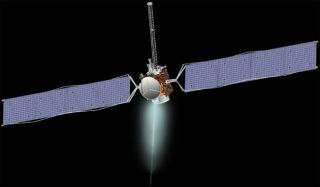 Europe?s SMART-1probe currently circling the moon also uses ion propulsion. ?This is,in fact, quite an ambitious mission,? said Colleen Hartman, NASA?s deputyassociate administrator for science mission directorate, during theteleconference. ?The things we?re doing here are tough, they?re not easy.? Dawn isdestined to rendezvous and orbit both Vesta and Ceres,two of the largest asteroids in the AsteroidBelt, in 2011 and 2015, respectively. ?Getting toCeres and Vesta will be opening up our eyes to newworlds,? McFadden said, adding that the large asteroids formed quickly in theearly Solar System and harbor many mysteries for scientists, including theirsurface composition and features. ?We just have the barest hint from maps thatwe?ve derived from the Hubble Space Telescopeon their surface features.? During itsdevelopment, the cost Dawn?s mission swelled from an initial $373 million to$446 million due to technical challenges, NASA officials said. That costoverrun ? and a 14-month launch delay from its intended summer 2006 target ?prompted NASA?s March 2 decision to scrap the mission, which came after $257million had already been spent, the agency said. Anadditional $14 million would have been required to cancel the missioncompletely, NASA said. Technicalchallenges revolving around Dawn?s propulsion system, xenon fuel tank andthermal stresses ? among others ? contributed to its cancellation, NASAofficials said, adding that those concerns have since been addressed byadditional data. ?What wehad here was a very gut-wrenching decision,? Hartman said. ?And we?re veryhappy to be going forward.? But areview process instituted by NASA chief Michael Griffin to evaluate thecancellation of NASA space missions proved successful for Dawn?s supporters. ?Thescience mission directorate decided to terminate it, and the appeal [was] tosee if we continue to fund Dawn or go on with that termination,? said AndrewDantzler, director of NASA?s solar system division at the agency?s Washington,D.C. headquarters, during an interview last week. NASA officialssaid Monday that the process is likely not one that will occur often, addingthat Dawn has accrued about $5 million in additional costs since the agency orderedmission managers and scientists to stand downlast fall when cancellation discussions began in earnest. ?Werevisited a number of technical and financial challenges and the work beingdone to address them,? NASA associate administrator Rex Geveden said in anearlier statement. ?Our review determined the project team has made substantiveprogress?we have confidence the mission will succeed.? The fundsto save the project likely prevented other programs from moving ahead, Hartman added. ?These arehard choices and sometimes future missions or current missions have tosacrifice,? Geveden added during the teleconference. Meanwhile,Dawn scientists and engineers have their work cut out for them before they canlaunch the spacecraft toward its asteroid targets atop a Delta 2 rocket. Abouthalf of the spacecraft?s hardware, which includes support components andscience experiments, is complete, NASA officials said. ?I want toget to both of them,? McFadden said of Vesta andCeres. ?I can?t believe I have to wait until 2015.? NASA Dawn Asteroid Mission Told To ?Stand Down?